Matsuura is a Japanese manufacturer of various milling machines. Considering automating your Matsuura with a loading robot? If so, Cellro’s Xcelerate is the right solution for you. Whether the machine involved is new or an existing machine, Cellro can automate 3-, 4-, and 5-axis Matsuura milling machines, allowing you to achieve more spindle hours and generate more output. Which Matsuura machines can Cellro automate? 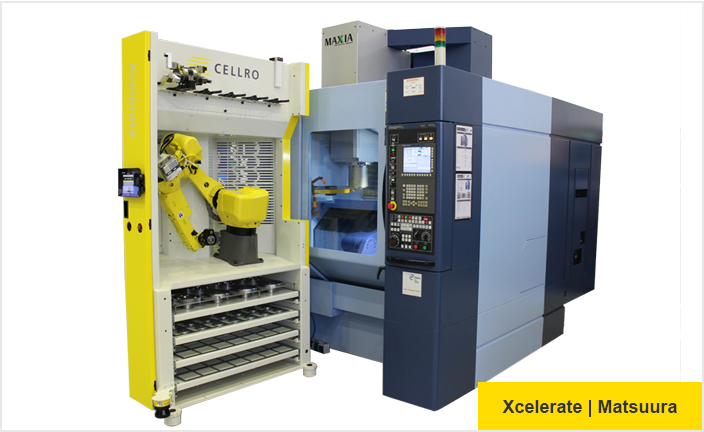 Cellro has the most experience in automating machines from the Matsuura MX series. Matsuura MX series machines load from the front. Xcelerate can be combined with all sorts of Matsuura machines to process small to medium-sized batches unmanned. Current Xcelerate users commend the loading robot’s user-friendliness and flexibility. Cellro also previously automated a Matsuura machine using Skid for MCM Liessel. The machines operate together seamlessly thanks to close collaboration between Matsuura and Cellro. Matsuura uses the Fanuc control system on all their machines. 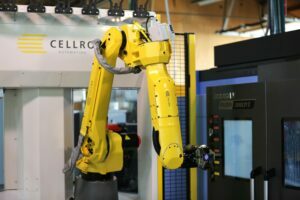 For Cellro, it’s a simple matter to link a loading robot to a CNC machine with Fanuc control. This makes the decision to automate a Matsuura even more attractive. With Cellro’s robot loading system, the Matsuura machine can keep working day and night. Matsuura normally removes the table on their 5-axis milling machines. The table is usually grooved to allow for mounting and machining of specific parts at various places on the table. When a CNC machine is automated, a pallet is placed in the machine and the items to be milled are positioned on this pallet. This combination of a table, a zero-point clamping system, a clamp and a workpiece wastes a lot of space. Matsuura therefore omits the table, mounting the zero-point clamping system directly on the fifth axis. This improves accuracy and provides a larger machining workspace. Want to automate a Matsuura? We will be happy to advise you. Would you like to learn how to utilise your Matsuura more efficiently? Please contact us. "Modulerate is easy to operate, and quick to set up." "The system usually operates for about 12 hours per day." Imminkhuizen Metaaltechniek is a true family metalworking business. Rijk Imminkhuizen founded the business together with his wife in 2008. 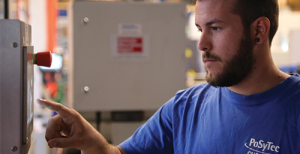 "Cellro has changed the way we think about our machining processes."